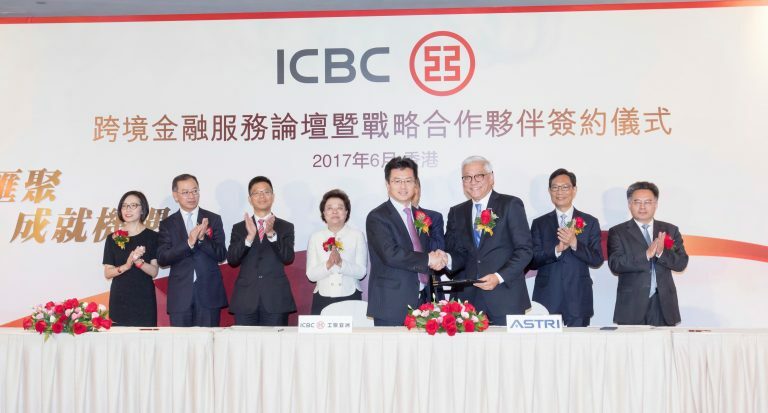 [Hong Kong , 28 June 2017] Industrial and Commercial Bank of China (Asia) Limited (“ICBC (Asia)”) and the Hong Kong Applied Science and Technology Research Institute Company Limited (“ASTRI”) signed a Memorandum of Understanding and announced the launch of ICBC (Asia)-ASTRI FinTech Innovation Laboratory (“the Laboratory”), aiming to develop latest financial technology (“FinTech”) applications in banking business and promote the development of FinTech in Hong Kong. 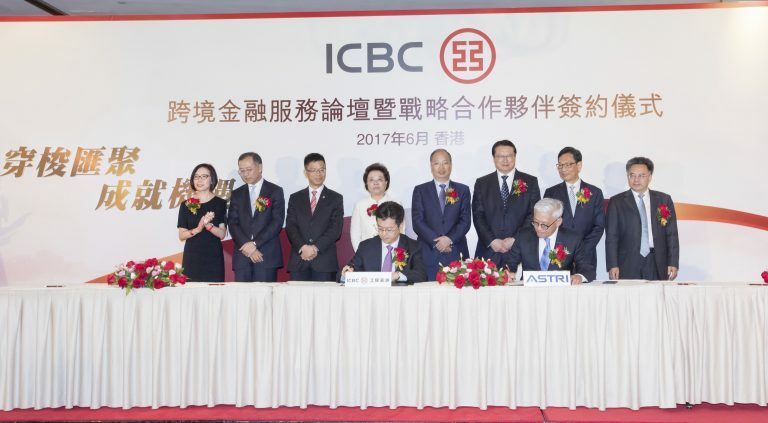 “ASTRI is pleased to collaborate with ICBC (Asia), the overseas’ flagship banking wing of ICBC, the largest commercial bank in China. By establishing a joint-lab in Hong Kong, we will work together in a series of FinTech initiatives. Among which, AI-assisted Customer Service, Robo-advisor and the Multi-language Social Data Analytics Platform are brand-new ideas in the market. AI-assisted Customer Service will use chatbots to take inbound calls in both Chinese and English, to identify customers’ needs and provide them with relevant information and services. The Robo-advisor idea aims to provide investment advice to clients based on their investment portfolio and rebalance the portfolio from time to time to meet expected returns. The Multi-language Social Data Analytics Platform collects data from various digital media. It can read Simplified Chinese, Traditional Chinese and English characters, and conducts big data analysis. These new capabilities will strengthen the local FinTech environment, and also add strong, practical value to the financial services industry. Once these technologies become available to the market, they will bring significant benefits to the entire sector,” said Dr Frank Tong, Chief Executive Officer of ASTRI. The Laboratory carries out research and development with focus on blockchain technology, big data analytics, behavioral biometrics authentication, artificial intelligence customer service, artificial intelligence on Chinese characters recognition, internet finance and cyber security and so on. ICBC (Asia) and ASTRI shall together exert influence by making use of each financial and technological expertise, not only to promote the FinTech development of ICBC (Asia) for more innovative, high-end and convenient banking services to customers, but to facilitate the development and application of FinTech in Hong Kong. Witnessed by honored guests, Mr Jiang Yisheng (left), Executive Director & Chief Executive Officer of ICBC (Asia) and Dr Frank Tong (right), Chief Executive Officer of ASTRI signed the Memorandum of Understanding and announced the launch of ICBC (Asia)-ASTRI FinTech Innovation Laboratory. (From left to right) Mr Wang Chaoming, ICBC (Asia) Assistant Chief Executive & Chief Information Officer; Mr Jiang Yisheng, ICBC (Asia) Executive Director & Chief Executive Officer; Mr Yi Huiman, ICBC Chairman; Mr Wong Ming-yam, SBS, JP, Chairman of ASTRI and Dr Frank Tong, CEO of ASTRI take photo together in the event. Industrial and Commercial Bank of China (Asia) Limited (“ICBC (Asia)”) is a licensed bank incorporated in Hong Kong. It has 59 retail outlets (including 28 “Elite Club” Wealth Management Centres) and 3 commercial business centres in Hong Kong. It is engaged in commercial banking, investment banking and other financial services including securities, insurance and funds, with a focus on commercial and retail banking as well as financial market related businesses. The total assets of ICBC (Asia) amounted to HK$798.7 billion at the end of 2016. Chinese Mercantile Bank and ICBC (Asia) Investment Management Company Limited, two wholly-owned subsidiaries of ICBC (Asia), are specialized in RMB services in Mainland China and the investment management business with a focus on Asia respectively. ICBC (Asia) is the flagship for the overseas banking business of Industrial and Commercial Bank of China Limited (“ICBC”) – currently the largest commercial bank in China. Hong Kong Applied Science and Technology Research Institute Company Limited (ASTRI) was founded by the Government of the Hong Kong Special Administrative Region in 2000 with the mission of enhancing Hong Kong’s competitiveness in technology-based industries through applied research. ASTRI’s core R&D competences in various areas are organised under seven Technology Divisions, namely Communications Technologies, Electronics Components, IC Design (Analog), IC Design (Digital), Opto-electronics, Security and Data Sciences, and Software and Systems. Five areas of applications including financial technologies, intelligent manufacturing, next generation network, health technology, and smart city are identified for major pursuit. For further information about ASTRI, please visit www.astri.org.